We all despise spending Sunday afternoon driving all the way to the mechanic's shop just for a casual maintenance trip. What's easier is to learn a few DIY car maintenance tips that will save you a lot of such trips. The easiest DIY car maintenance task is checking and changing the motor oil in the engine. The sad truth is, we all are too lazy to do it as recommended. Another reason why many people don't change the motor oil is probably the number of myths and misconceptions built around the subject. Some people advise on changing the oil way too often while some think of it as a complete waste of time and money. Whose side would you choose? Of course, the one most beneficial for your car in the long run! So, let us straighten out some facts, bust some myths and find out how long exactly motor oil can serve its true purpose. Well, motor oil needs to be changed for the same reason you change cooking oil in the fryer. Yes, it gets contaminated. The basic purpose of the motor oil itself is to protect the engine against contaminants. It prevents the formation of sludge, thus enhancing the performance of your engine. The motor oil does all this by holding all the contaminating particles in suspension. Think of it as taking a bullet for its lover i.e. your engine. When the oil gets too saturated with these particles, there comes a time when it fails to perform its duty. As a result, sludge starts to settle on your engine parts and hinders the efficiency and performance. During the 80s, hundreds of car faced a terrible engine seizure issue due to accumulation of a tar-like sludge in the engine. They called it the 'Black Death' and insurance companies wouldn't cover it. Later the reason turned out to be overused oil. In order to keep your engine completely sludge free, it is best to change the oil before it reaches the 'Black Death' point. 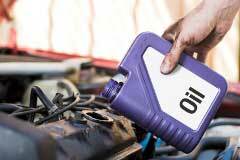 Some people suggest that the oil change period depends on your driving habits, routine and your car's make and model. While these things do matter, the difference they make is almost negligible. There is an age-old myth which suggests an oil change every 3000 miles. Today, detergent based and synthetic oils have greatly changed the scenario. Synthetic oil is excellent at preventing sludge for more than 3000 miles, but the myth about not having to change the synthetic oil is still baseless. The best and safest bet is to go for your manufacturer's recommendation i.e. approximately 7500 miles for most cars. If talking about the shelf life, oil is a product that can literally outlive anything else on this earth. Yet, when it comes to engine oil, the additives can go bad over time. This is unless you have kept it in 'nearly impossible' ideal conditions. Even then, the industry's changing standards may make older oils completely useless or even destructive for the engine of a newer car. If you are not very fond of reading the manual, you might be surprised to know that each car comes with a manufacturer's recommended interval for oil change. For most cars, the average interval is 7500 miles these days. While synthetic motor oil will last longer, it is best to follow the same instructions. A more surprising fact is that the oil change recommendation for the same car varies from place to place. A particular model of Toyota may have a different recommend interval for the US and Japan. This is majorly because of difference in climatic conditions as well as the quality of fuel. For instance, in the US, the fuel usually contains high sulfur level which results in more contamination. Whereas, in Japan, the sulfur level in fuel is lower which helps the oil last around a thousand more miles. Moreover, manufacturers usually recommend two different oil change schedules for a particular car. They call it severe service or normal service. It actually specifies the conditions you drive in. If you drive mostly on rough terrain with lots of dirt and mud, you will require a frequent oil change in comparison to someone driving on highways and freeways.